This product is great and even more amazing is the price. I use it in my septum piercing. Was easier to get in than some other circular barbells I have used. Ordered it a little too big in diameter as I like to be able to flip them up in my nose when needed and 12mm is too big, however it is great for when not at work, I will definitely buy another. I love this item! I have this in my labret piercing ^-^ looks awesome. I bought the 8mm, this was a little tight for my lip, but i'm getting used to it now. I bought 5 different products for my labret when I bought this on, and by far, this is the best, so glad I decided to get this! Fits perfectly, balls were a little hard to get off at first but it's very nice in my septum and i'm really pleased with it. These are great value, and they have a nice shimmer to them as well as aposed to some jewellery I've bought which has been quite dull. I bought this in 8mm diameter for my septum but it was a tad too big so I use it for an ear piercing, and it's lightweight, comfortable and cheap. This is a straightforward circular barbell that is high quality, versatile and understated. I've used it in my ear piercings and my lip piercing (which is unfortunately no longer with me). The balls are relatively easy to grip and manipulate, and they bite the thread relatively easily. These are great value for money even with shipping included. At least £2 cheaper than my local piercing place ! 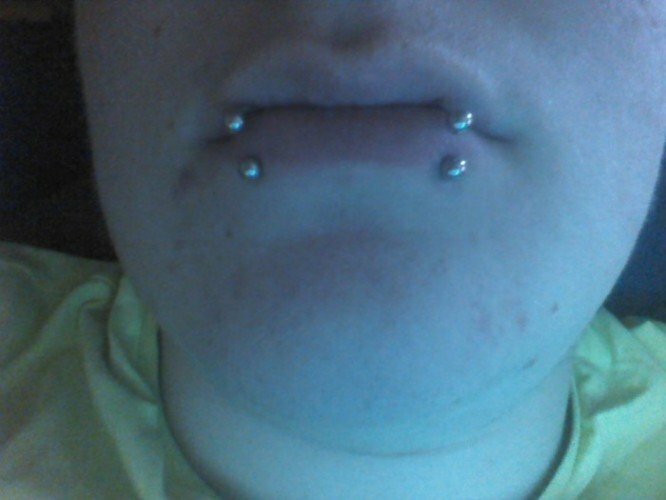 Really comfortable and can be used in a variety of piercings. Very nice. I might buy this again with a smaller diameter for a tighter fit on the lip.